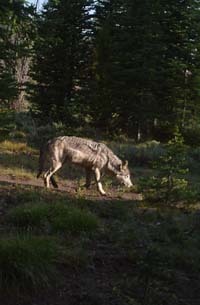 The alpha female of a wolf pack northwest of Ketchum is spotted by members of the Wood River Wolf Project field crew. This wolf is likely the mother of the pup that was separated from its pack on Memorial Day weekend. Photo courtesy of Wood River Wolf Project. An adult female wolf was killed on the Flat Top Ranch last week following a kill order for three wolves that had reportedly killed eight sheep early last month. Wildlife Services State Director Todd Grimm said the wolf was trapped and killed on Wednesday, July 18. He said he didn't think there was a pack still in the area. "That's the only one we've had any sign of at all," he said. "I'm hoping they've moved off." Grimm said Wildlife Services has two weeks remaining to fill the entire kill order, which was issued June 6 for three wolves. But he said that since there's been no further sign of wolves, he's uncertain whether the full control action will be filled. The wolf was not killed on the 1,100-acre conservation easement held on the ranch by The Nature Conservancy. The terms of the easement restrict the use of lethal control methods within the easement's borders, but do not regulate them outside its borders. Blaine County contributed $200,000 from the proceeds of the Land, Water and Wildlife Levy toward the purchase of the easement. Idaho Department of Fish and Game Magic Valley Regional Supervisor Jerome Hansen said last week that tissue samples from the wolf were sent to two labs to test for genetic background. "We're developing quite a database on the genetics of the wolf population," Hansen said. Wood River Wolf Project coordinator Suzanne Stone, who works with livestock producers throughout the valley to prevent wolf-livestock conflict, said Monday that she is no longer working with John Peavey, the ranch's owner. "They declined our offer for help," she said. "We're hopeful they will seek some help in the future." Stone and other members of the Wood River Wolf Project crew are still working with producer John Faulkner, who lost four sheep near Lake Creek on July 3. The control order for "any offending wolves" is still out and unfulfilled, though Grimm said the traps from the Lake Creek area have been removed. "We don't have any indication the wolves are there," he said. "If we find hot wolf sign, we'll put traps on the ground." However, he said, the traps will be focused on trying to put a radio collar on a wolf rather than killing it. Commissioner Larry Schoen, who met with Hansen and representatives from Wildlife Services last Thursday, said state officials are trying to put more of an emphasis on nonlethal deterrents, many of which rely on having those radio collars to track wolf activity. Schoen said that in cases of depredation, officers will recommend the services of the Wood River Wolf Project, whose members can help producers implement nonlethal deterrents to prevent further losses. "That's a really important step, as it shows that there is better communications among all parties and a sense that deterrents have value and can avoid future depredation," he said during a county meeting Tuesday. The Wood River Wolf Project field crew has spotted the alpha female of the Warm Springs pack that lost a pup over Memorial Day weekend. The pup was sent to Busch Gardens in Williamsburg, Va., after Idaho officials could not find fresh sign of the pack in time to reunite the pup with its family. Program coordinator Suzanne Stone said the female was found less than four miles from where previous tracks were found, and she believes the wolf has taken her remaining pups deeper into the mountains. Sheep rancher John Faulkner has a band of sheep in the area. Stone said program field crews are sleeping with the bands.